LEWISTON, Idaho – Ross Hill’s comeback is complete. The Bullfighters Only veteran suffered a devastating knee injury in 2016 that took him out of competition for a year and a half. 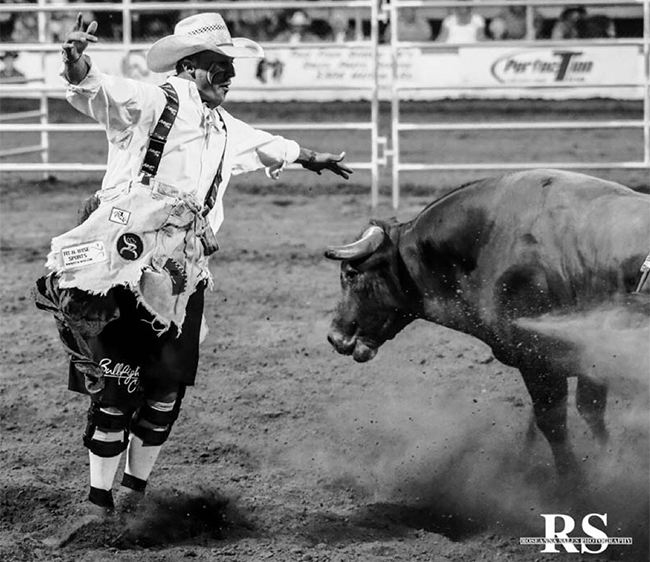 He returned in July, then promptly won the BFO Wrangler Bullfight Tour stop at California Rodeo Salinas. He’s competed in three Wrangler Bullfight Tour stops since then, and he’s found his way to Victory Lane in all three rounds. He picked up the Round 1 win with 91 points at the Lewiston Roundup on Wednesday and overall titles in both Kennewick and Ellensburg. He will compete for the Lewiston title on Saturday night. Last Friday night, Hill earned the Ellensburg title with an agile 86.5-point fight, showing the packed crowd that his knee injury is well behind him. The weekend before in Kennewick, he posted a 77-point score, tying Justin Ward, but Hill earned the title on the tie-breaker with the highest bullfighter score. The “Alabama Slamma’” has certainly been on a roll. He has now pocketed more than $10,000 and has moved into the top 10 in the Pendleton Whisky World Standings. His recent success on the BFO Wrangler Bullfight Tour is all part of his plan to compete at the BFO Las Vegas Championship, held Dec. 6-15 at Tropicana Las Vegas. It’s BFO’s pinnacle event and features the biggest prize money in the game.